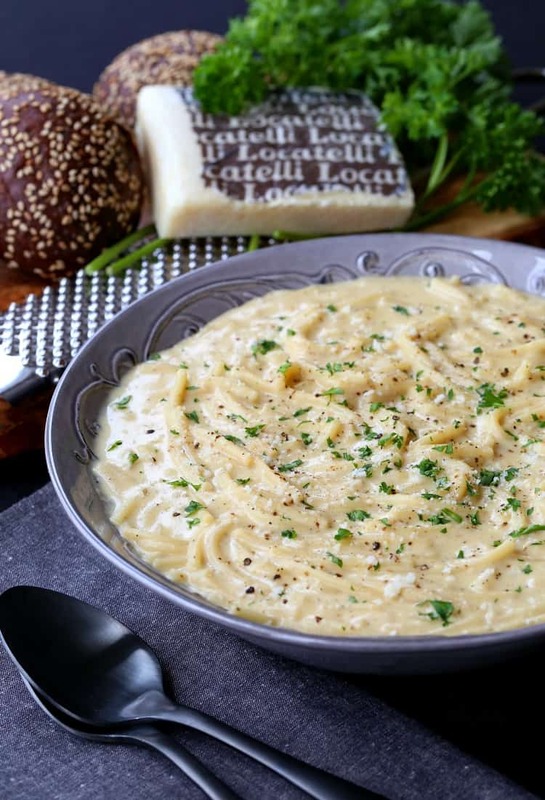 Just one bite of this Cacio e Pepe Chowder and you’re going to be hooked. 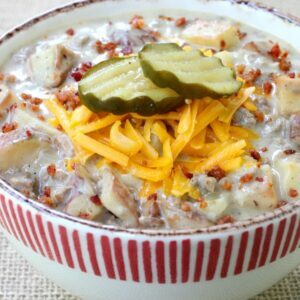 This creamy, peppery chowder is the best comfort food soup recipe ever! Love comfort food recipes? We’ve got lots. We’ve got Slow Cooker Comfort Foods, and a whole collection of Comfort Food Dinners so get your elastic pants ready! 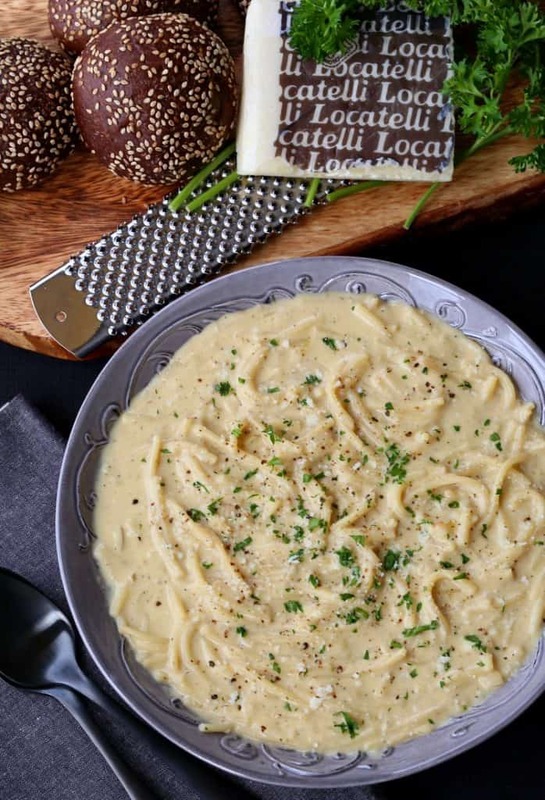 Cacio e Pepe is a Roman pasta dish that means cheese and pepper. 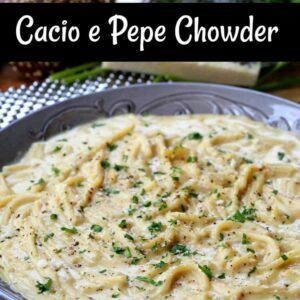 The ingredients are simple, pasta, pepper and parmesan or pecorino romano cheese. One bite of that pasta and I was hooked. And I’m not even a huge pasta fan – I can honestly take it or leave it. Christie on the other hand would eat it every day, at every meal if she could. She’s the one that made me try it when we were at Eataly and I’m glad she did! This easy chowder recipe is like another soup recipe of ours, Beefy Tomato Soup. Both recipes have lots of pasta in them so after it sits in your fridge for a day or two the pasta is going to soak up some of the broth. 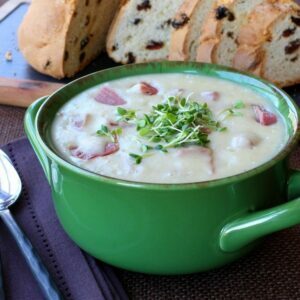 But I promise you – this chowder recipe – it is AMAZING. Maybe it’s just a make it and eat it kind of thing because when it’s done it’s PERFECT. And I can say that because we made it three times before getting it just right. I am also going to tell you that after making this three times in a row we did have a few leftovers…be we love leftovers. Totally versatile. So actually maybe double this and use it as a base for another meal. It works. 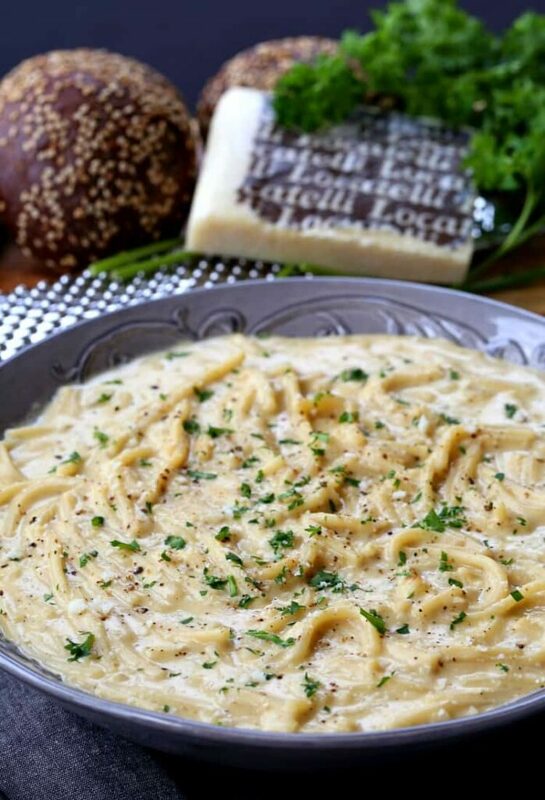 Start out this chowder recipe by breaking up spaghetti into thirds and getting it in your pot along with onions, garlic and butter. 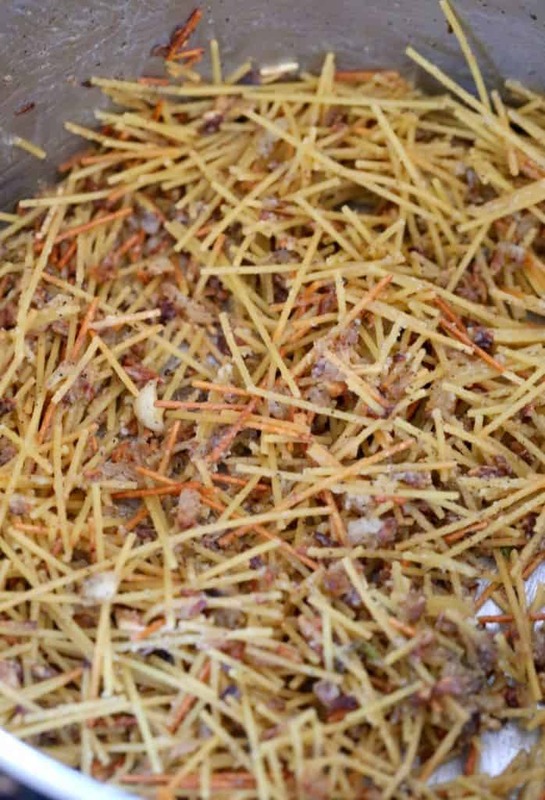 Get a wooden spoon in there and break up the spaghetti even more as you toss it around in the pot. Some pieces will be bigger and some will be smaller, that makes for good chowder. 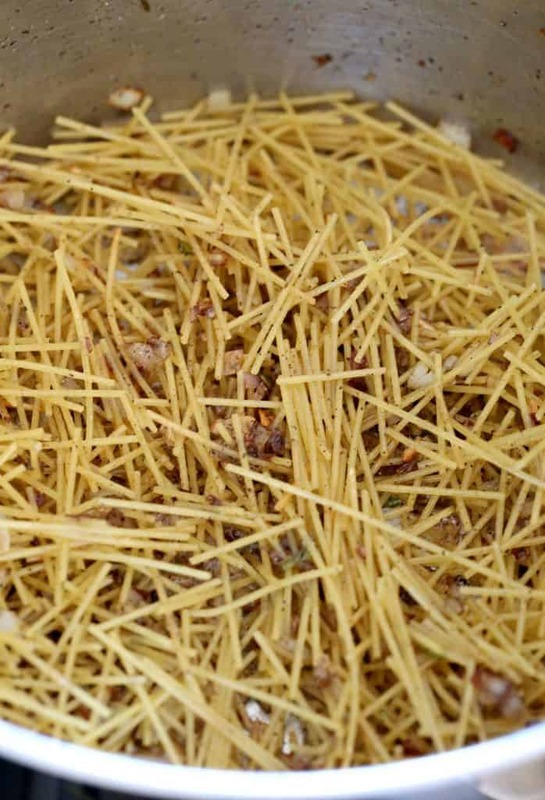 Once the pasta gets toasted like this you’re ready to add the broth. Bring the broth to a boil then turn down the heat and let the pasta cook in the broth, covered for 10 minutes. 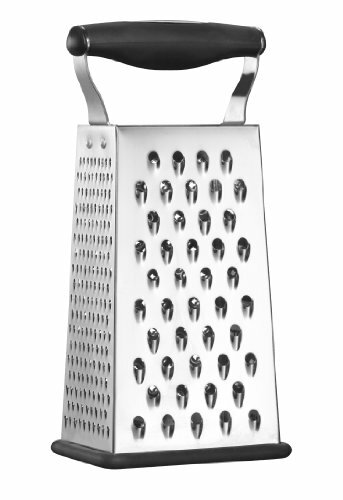 You’re going to need to stir a few times in between so the pasta doesn’t stick so don’t walk away. Now the grated parmesan and more fresh black pepper and it’s chow time for the best chowder recipe you’ve ever tasted. 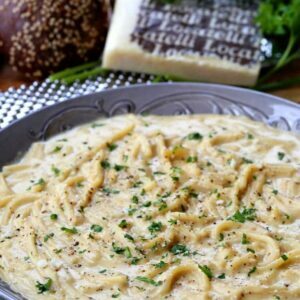 Oh yes, you should absolutely grab a big piece of crusty bread to go with this Cacio e Pepe Chowder! Because at this point, who cares about the carbs? This creamy, peppery thick spaghetti chowder is a total comfort food win! 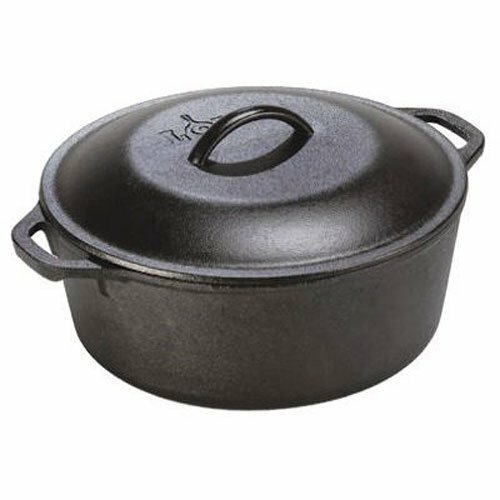 Heat the oil and butter in a large dutch oven over medium-low heat. Add the garlic, salt and pepper to the onions. Stir and cook for another 2-3 minutes. Break the spaghetti into thirds and add to the pot, breaking up with a spoon as you stir. Cook, while tossing, over low heat until you start to see some of the spaghetti turning a light brown color. Once the spaghetti starts to toast, sprinkle in the flour and toss to coat with the pasta cooking for another minute or two. Once the pasta is tender, pour in the milk, cream and parmesan cheese and stir. Cook uncovered for 10 minutes, stirring until thickened. Taste for seasonings then serve with chopped parsley, more fresh pepper and parmesan cheese.